In our constant endeavour to give our readers content that is a little ‘hatke’ from the trade media norm, Adgully has been coming out with Special sections like The W-Suite, Ad Land’s Young Guns, Spirit W and more. Our latest offering is ‘Offbeat’. Our weekly series ‘Offbeat’ seeks to present the lesser known facets of our very well-known industry leaders. We present, in the industry leaders’ own words, an interesting read on areas that are not usually highlighted in regular media coverage – be it about their childhood days, secret skills that they possess, how they unwind from their hectic schedules, and much more. 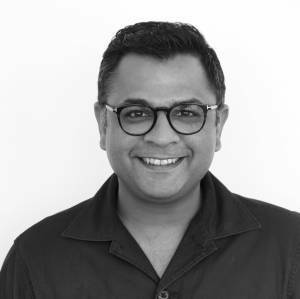 Kartik Iyer, CEO, Happy mcgarrybowen, has been growing his agency from strength to strength. What started out as a two-people outfit in 2007 is today a 92-people strong agency that is part of a rapidly growing network like Dentsu Aegis Network. The former Creative Director of Ogilvy & Mather moves to different genres of music, wants to read people’s minds like X-Men’s Professor X, is also good at imitating accents and people, and like to be AWOL from the corporate world, if he could. I was a very dreamy kid! I loved playing with cars and Lego. I loved music and dancing. I watched a lot of recorded British TV since I had spent the first 10 years of my life in Africa. So I loved watching ads and imitating the jingles and the voices. I watched a lot movies. I guess nothing much has changed. I still collect miniature cars, always listen to music, dabble with advertising, watch lots of movies and imitate people and noises even today. To be honest, I didn’t look up to any superhero. I would just think I was them, whoever was the seasonal favourite. But above all, I would choose Batman as my favourite. The outfit and the gadgets do it for me. If you ask me today, the super power I would like to possess is to read people’s minds. Like Professor X (Charles Francis Xavier) from X-Men. To lose the creative spark is my biggest fear. And losing the ability to make people laugh. Ask any good creative person and he/she will tell you, all of it comes from some place else. Call it the subconscious. The fear is to lose the ability to tap into that source. The only way to deal with it is to do something creative everyday. My ex-boss Shahir Zag once told me that the creative arts are like martial arts. You have to practice everyday for you to evoke the ability to deliver and execute without warning. I am good at imitating accents and people. All kinds of music – Psychedelic rock, Classic rock, Funk, North African Blues, Jazz, Carnatic, World music, Disco and Hip Hop. Considering I live in Bangalore, it is not an everyday go-to activity. Nothing relaxes me more than the ocean. On a more regular basis – music. One really doesn’t have control over everything. There is a larger system at play. Call it the universe if you will. One can only be in the moment and do their best. The satisfaction that you have given your best is your reward. The outcome is only for the world to see. Anything that is working to an open, balanced society. Most of the world is living in a clouded reality. Things that have existed since the beginning of time are being challenged by fundamental or capitalist pigs. People need to know the truth about everything. The world as it stands today is rapidly dying from over-consumption. And most people don’t even know about it. If I could hide the thoughts that appear on my face. If not ‎CEO at Happy mcgarrybowen, what would you have been? AWOL from the corporate world. ‘Sanyukt’ bids adieu to its viewers!